Why is my child crying bloody tears? What would you do if your child started having bloody tears? Often I write about things that most of you will deal with at some time or another. But, every now and then, something really interesting grabs my attention as something that you might find interesting, even if it’s highly unlikely you’ll ever see it. This is one of those posts. Children can cry bloody tears. It’s very rare. It’s usually not caused by anything concerning. But, imagine if your child walked up to you with blood streaming down his or her face. I would hope that if your child got poked in the corner of the eye and was crying bloody tears, you would be able to quickly deduce the cause but here it is. Sometimes infections (like pink eye) can cause enough inflammation such that bleeding can occur. The tissue around the eye is pretty fragile and when it is inflamed, small cracks can cause it to bleed. Bloody tears seem to sometimes happen just because. Even after investigation into possible causes, no diagnosis is made. These cases tend to resolve over a few months. There are a few conditions that can cause children to bleed more easily. Some children are born with them and some develop them over time. If a child has easy bleeding or excessive bruising, this could be the cause. Children with bloody noses can also shed bloody tears. How? There is a small tube that connects the corner of the eye to the area behind the nose. It’s called the tear duct and this tube is the reason why your nose starts running when you ugly cry. If your child’s nose is bleeding a lot or if they are trying to stop a bloody nose by applying pressure and sneeze or blow out hard, the blood can come out the duct as a tear. What do you do for your child if they have bloody tears? Of course, it’s different for each cause. If there’s a stick coming out of it, go to the emergency room. If the child has had red eyes, other signs of easy bleeding or you can find no other cause, call your doctor. If your child has had a bloody nose, continue to apply pressure to the nose to stop the bleeding. Once the bloody nose has stopped, the bleeding tears should stop. If it doesn’t, call your doctor. This article caught my eye because a few years ago a teacher brought a JK child to the school clinic. She had bloody tears coming from one eye. There was no injury at the time. I had never seen this before. I called her mother and advised them to go to the doctor. Nothing was done and it never happened again! However, it was sort of strange! Thank you for writing this. Thank you so much, I thought I was losing my mind. It is 1 am here and I just had a call from my 9yr old that was on a sleep over. 'Mom, my eye is bleeding, again.' This is the second time, I witness the first. Threw him in the van and flew to the hospital. Clerk asks, 'here for a nose bleed.' I say to her, 'Sweetheart, I have 4 sons, are you kidding me! I am here for an eye bleed!!' The doctor didn't even believe me, she seen no signs. We were sent home with the advice to video tape it next time. I thought I was losing my mind. Tonight his friends mom witnessed what only can be described as gross, creepy, freaking, demonic looking, tears of blood build and drip. This time as I am not one to run to emerg to be made to feel like an idiot, we came home and googled!!! Found this Thank You! I wonder if cauterizing his nose would help with this? Thank you for sharing your child’s nose bleeding stories. 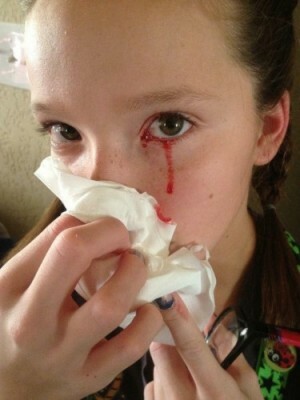 I have an 8 year old who has nose bleeding since todler but never with bloody tears until recently. For the first time seeing my child with bloody nose and blood dripping down from her eye was so frightening. I took my child to her doctor the next day and he didn’t seem to be concerned so much but recommended me to see an eye and nose specialist just because I am concerned, he said. Now reading this stories of kids who have the same problem with my child makes me feel a bit relieved. Thank you again for sharing your stories! I got nose bleeds often as a child. They were always fairly mild until one day out of nowhere came the most violent nose bleed you could ever imagine. I was 12 years old and home alone when it happened. I was desperately trying to stop the bleeding but it was pouring out of both nostrils like a high pressure faucet. There was blood coming from my eyes too. Blood was everywhere and needless to say I was worried but after about an hour or so I got it to slow down and eventually clot. The clots that came out later were immense. I felt woozy from all the blood loss and didnt go to school the next day. Interestingly enough, this was like the nose bleed grand finale for me, as I have not even experienced a mild one since then and I am 40 years old. This article was so helpful! I was Googling nose bleeds and bloody tears and found it. I had just left a message for the triage nurse at my son's doctor's office because today he had a bloody nose and for the first time it came with bloody tears! While waiting for a call back from them I found your article. I feel much calmer after reading the stories of other children having the same issue. He's 7 years old and it gets the occasional nose-bleed but never with bloody tears (until today). Thank you! Hi. My son's nose did this for a long time. I remember the school calling me and having me come and get him because he had blood coming out of his tear ducts when his nose was bleeding. They were of course freaking out and I had already seen it at home. Of course I freaked out but didn't let him see that. I took him to the doctor and the doctors said they had never seen it. It wasn't until I took him to a surgeon who said it was possible if the flaps in his nose went the wrong way or were loose like a loose flip floppy valve in your heart. And when his nose was bleeding so hard it pushed the valve open and it went out his tear ducts. Since then he has had surgery on one side and needs surgery on the other because they said when they got in there he had very large blood vessels on the surface in the back part of his nose. Not to where you can reach them either. so he has one side done and the other side still bleeds almost daily and he needs to schedule to have it done whenever he finds time. He's 33 yrs old! Thank you so much . Having a pink eye and noticed my eyes have bloody tears , thought I was dying at some point .